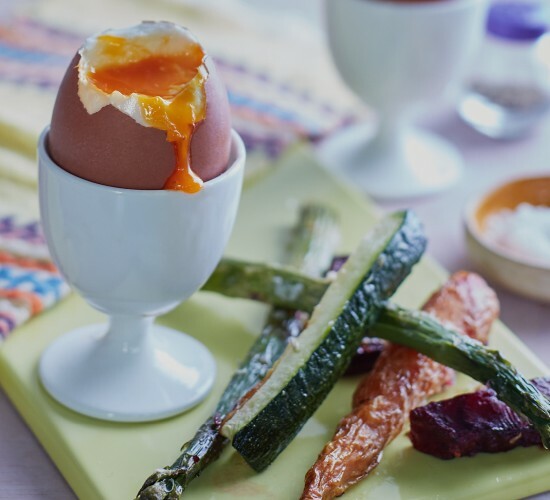 A perfect soft-boiled egg with soldiers has to be the ultimate comfort food. We’ve given our soldiers a nutritious twist by swapping toast with colourful roast vegetable strips to dip into the runny yolk. Preheat the oven to 190°C/375°F/gas mark 5. Prep your soldiers first by chopping the beetroot into 1cm-wide ‘chips’. Pop the beetroot on a roasting tray with the asparagus, baby carrots and courgettes. Drizzle with oil and sprinkle with fennel seeds and grated Parmesan, then season. Roast in the oven for 15 to 20 minutes until they’re starting to crisp up. To make perfect, runny soft-boiled eggs, bring a small saucepan of water up to the boil before lowering to a quick simmer. Add the eggs into the saucepan and set a timer to cook for five to seven minutes, depending how runny you like the yolk. The more eggs you have in the pan, the longer this will take. Serve the boiled eggs with your colourful soldiers. Happy dipping! Eggs are a rich source of selenium, vitamin D, B2, B6, B12 and minerals including zinc, iron and copper.